Sick of your iPhone's puny lens? Then it's time for a (somewhat unwieldy) upgrade. This "iPhone DSLR prototype" is a 1.1lb, solid piece of anodized billet aluminum (that looks to be a modified Owle). 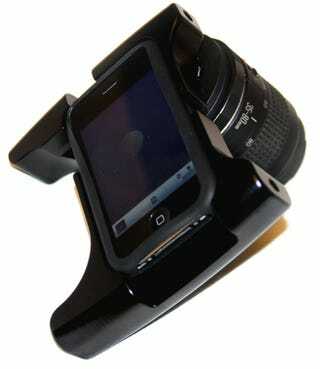 It will fit an iPhone 3G, 3GS or 4 along with a complementing, full-size Canon EF lens. And since Canon converter mounts are widely available for most lens brands, I'm guessing this rig could fit pretty much any lens you tossed at it with some tweaking. Is this a real DSLR? Of course not. As many angry camera snobs have pointed out, there's no internal mirror system to control light hitting the iPhone's camera sensor. But could it milk the 5MP iPhone sensor for everything it's worth given access to some premium glass? Theoretically, yes.